If you are reading this, there’s a good chance you want to understand ear piercing better before making a decision about where to be pierced. As you’ve probably figured out by now, not all ear piercing systems are created equal. Some people wonder about the safety of having their ears pierced in a retail environment. We can assure you that if you choose your location wisely, having your ears pierced in a retail setting is both safe and convenient. We’ve put together this quick guide to help clear up some common misconceptions. Here are 5 key points to help you see how safe & gentle retail ear piercing with the Inverness system can be. We cringe when people call our piercing instrument a “gun”. Our specially-engineered, human-powered instrument is designed to pierce the ear quickly in one smooth, quiet, hand-pressured motion. Our piercing instrument provides greater accuracy than a “gun” when piercing the earlobe or cartilage. Traditional piercing guns “shoot” the starter earring through the lobe or cartilage using spring-loaded power which can be loud and painful as well as more difficult to aim. Our system pierces your ears and attaches our patentedd Safety Back™ in one smooth, rapid motion using only hand pressure. Happily, most people report feeling no discomfort being pierced with the Inverness System. The Inverness System pierces ears with specially crafted fashionable piercing earrings that have an ultra-thin piercing post and an extra-sharp piercing tip. The sharp piercing tip is designed to glide easily through the earlobe with hand pressure for a smooth, quiet piercing that minimizes sensation and ensures as gentle a piercing as possible. At Inverness we are proud to be the only ear piercing system with sterile, fully-enclosed earring capsules that minimize the risk of exposure to contaminants prior to piercing. Each earring capsule is packaged and sealed in sterilized cartridges that are not opened until the time of piercing. We also have a unique push button eject system that allows the piercer to dispose of the used capsule without touching it. All Inverness piercing earrings come with the unique patented Inverness Safety Back™ which covers the sharp piercing tip. This provides maximum air flow during healing and eliminates the risk of accidental over tightening of the earring. 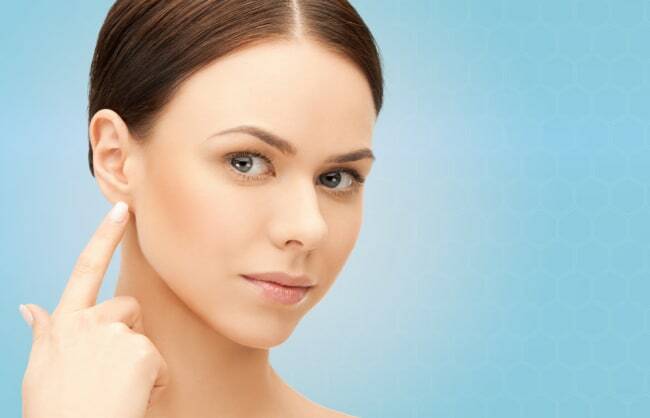 At Inverness, we know the ear piercing aftercare is just as important as the piercing itself. Keeping your piercing clean is crucial for safe healing. We have compiled a thorough guide to walk you through the process. Our Inverness Ear Care Solution has been specially formulated for optimal care of newly-pierced ears. It cleanses safely and gently without stinging or burning. The active ingredient is Benzalkonium Chloride which will not dry or chap the skin like alcohol or hydrogen peroxide. We hope this information will help you make a more informed choice about where to have your ears pierced. The Inverness ear piercing system is used in department stores, accessory stores, salons, pharmacies, and doctors’ offices worldwide. For more details or to find the Inverness location nearest you, use the Inverness Store Locator. Happy piercing. Can I Reuse Ear Piercing Studs? Looking for Stores that Pierce Ears? It’s not called an Ear Piercing Machine. Here’s Why. ©2019 Inverness Corp. All Rights Reserved.